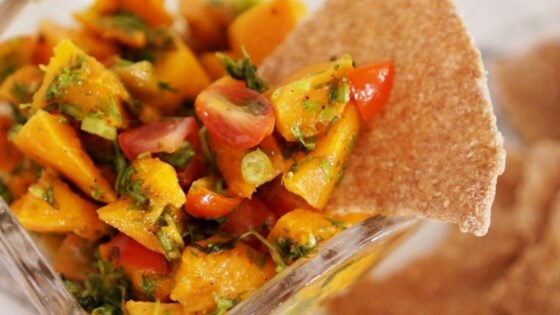 "This is a very tasty mango salsa that is great served over fish. My favorite is any fish blackened with Cajun seasoning and then topped with this salsa. Also great for dipping chips." In a medium bowl, mix mango, red bell pepper, green onion, cilantro, jalapeno, lime juice, and lemon juice. Cover, and allow to sit at least 30 minutes before serving. A simple fresh mango salsa takes grilled tilapia straight to the top! Tasted very fresh. I like chunky salsa but would recommend to the people who thought it was "too chunky" to refine their knife skills a bit as they are the one in charge of the "chunkification". I only used the ingredients the recipe called for since they are all my favorites! It's now become a frequent request at work. Definately make it the night before for the flavors to blend. I loved this recipe, it is so colorful! I added 2 ripe nectarines, diced. I used sweet red onion instead of the green onion and I added a dash of balsamic vinegar. The result was very good.